Combine a powerful reverse transcriptase and DNA polymerase technologies to deliver precise and accurate analysis of gene expression. One-Step qRT-PCR Kits with ROX combine the most powerful reverse transcriptase and DNA polymerase technologies to deliver precise and accurate analysis of gene expression in a convenient, high-throughput one-step format. SuperScript III Reverse Transcriptase produces higher yields of full-length cDNA for broader gene representation. 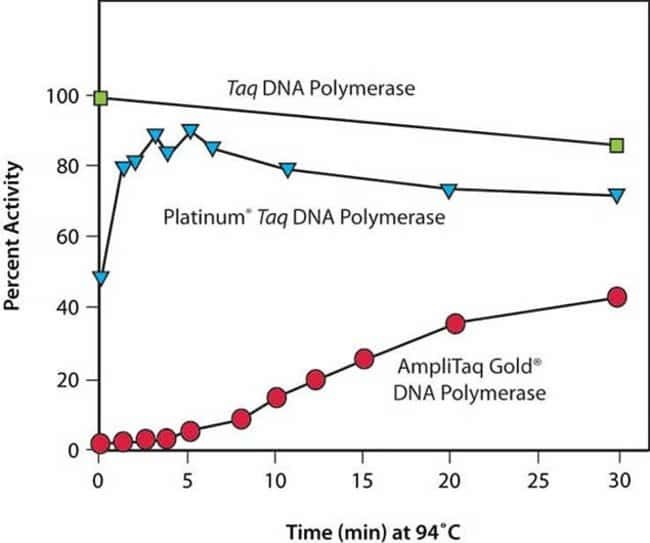 Platinum Taq DNA Polymerase activates faster and more completely than other hot-start enzymes to deliver more sensitive amplification. ROX reference dye premixed at optimal concentration for ABI instruments. Includes SuperScript™ III RT/Platinum™ Taq Mix, 2X Reaction Mix (containing SYBR™ Green I, ROX Reference Dye, dNTPs, and MgSO4), and 50mM MgSO4. SuperScript™ III Platinum™ One-Step qRT-PCR Kit with ROX includes SuperScript™ III RT/Platinum™ Taq Mix, 2X Reaction Mix (containing ROX Reference Dye, dNTPs and MgSO4), and 50mM MgSO4. Storage Requirements Store all components at -20°C. Store ROX Reference dye in the dark. Store in freezer (-5° to -30°C).